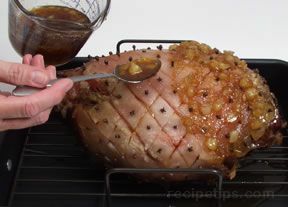 Knowing a little about ham helps to insure that you are selecting ham that is the appropriate type and quality for the ham recipe you are preparing. 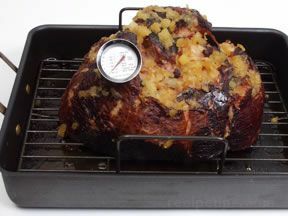 See our Ham Cooking Times to be sure you are cooking the ham for the appropriate time to produce a safe and delicious ham. 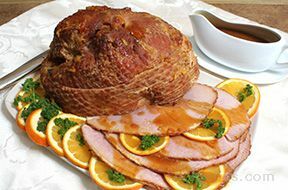 When selecting ham there are several factors that you need to consider to be assured of purchasing the correct quantity, quality and type of ham to satisfy your needs. It is important to be familiar with the different cuts that are available, know what to look for on the food labels, know what to look for when visually checking the ham, and be able to determine how many servings per pound the type of ham you have selected will provide. Having this information will help you make a purchase suited to your needs and cooking method you will be using. Decide the type and quality of ham that you want for your serving intentions. You would not want to select a "ham and water product" to serve for a nice ham dinner and you would probably not purchase a "ham with natural juices" to make sandwiches for lunch. 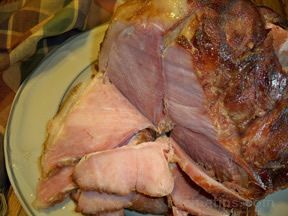 Determine whether you want a bone-in ham for the additional flavor it provides or a boneless ham for the ease of carving. Know a head of time the number of people you will be serving and take into consideration their eating habits. If you are serving a number of teenagers in comparison to small children, the quantity you need will definitely be affected. See Quantity to Buy. Read the food labels on the ham carefully to be sure you are getting what you expect. Be knowledgeable about the terminology used on the food label. See Read the Label. 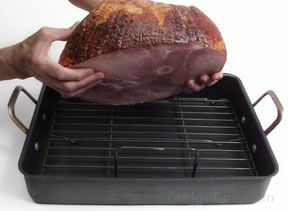 Hams can be quite large, so be sure you have a pan large enough to cook the ham. If not, consider purchasing two smaller size hams to satisfy your needs. 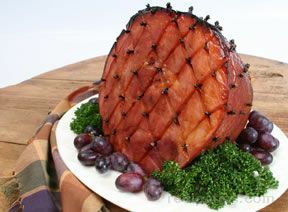 Realize that the better quality hams and extra features will generally add to the cost of the ham. Always select ham and ham products that has been inspected and approved for wholesomeness to guarantee that it was processed under sanitary conditions and is free of disease. 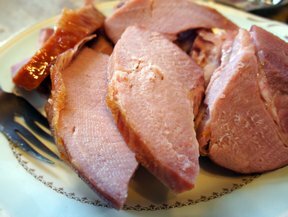 Becoming familiar with the different cuts, types, and features available for ham will help you understand what you are looking for and why you may want one ham over another. Being knowledgable about the different ham features will help determine if a less expensive ham will satisfy your needs or if you would prefer to spend a little more for the better quality. 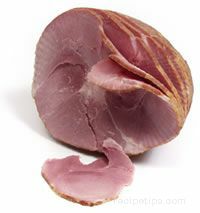 See Types of Ham for information on different cuts types and features available. 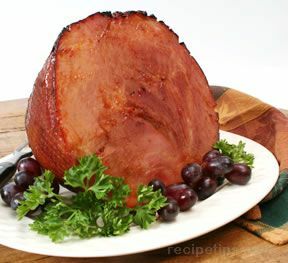 You can tell a lot about the ham by reading the food label, such as the cut, whether it is a whole or half ham, whether it is uncooked, partially cooked, or fully cooked, the a description (bone-in or boneless), the date it was packaged, total weight, cost per pound, total cost and nutritional information. The USDA requires the food label to indicate the amount of curing ingredients that have been added to the ham. 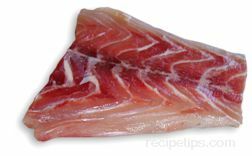 This is indicated by labeling the ham in the following manner. Ham Indicates that no water has been added and the ham is at least 20% protein. Ham with Natural Juices Must be at least 18.5% protein and can weigh 8% more than its uncured weight. Ham with Water Added Must be at least 17% protein with no more than 10% added curing solution. It can weigh 8% more than its uncured weight. Ham and Water Products The ham can have any amount of water added during the curing process but the percentage of ingredients added must be indicated on the label. The USDA allows other descriptive terms to be used on the food label, but the ham must meet specific requirements before they can be used. Some of the common terms you may see are shown below and an explanation of what they mean. "Lean" Ham The ham must contain less than 10 grams of fat, 4.5 grams or less of saturated fat, and less than 95 grams of cholesterol per 100 grams and per Reference Amount Customarily Consumed (RACC). "Extra Lean" Ham The ham must contain less than 5 grams of fat, less than 2 grams of saturated fat, and less than 95 grams of cholesterol per 100 grams and per Reference Amount Customarily Consumed (RACC). Hickory Smoked To be labeled "Hickory Smoked", hickory wood must have been used in the smoking process. Honey-Cured A term used if honey is the only sweetening ingredient or at least half of the sweetening ingredients used in the curing process. 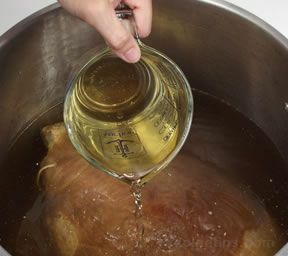 The amount used must be sufficient enough to affect the flavor and/or appearance of the honey-cured ham. Sugar-Cured A term used if cane or beet sugar is at least half of the sweetening ingredients used in the curing process. 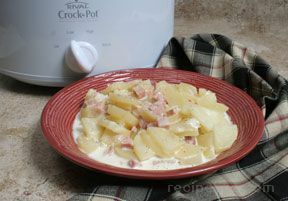 The amount used must be sufficient enough to affect the flavor and/or appearance of the ham. The label on the ham may have a "sell-by date" printed on it even though there is no federal regulations mandating product dating. The "sell-by date" represents the last day recommended for selling the product. Generally the store will pull any products left on the shelf the day of the "sell-by date". 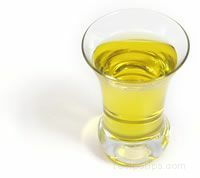 It is recommended that the consumer does not purchase the product if it is after the "sell-by date." If the meat is properly refrigerated, it will remain fresh up to three days after the "sell-by date" but if it is not to be used within that time, it should be frozen. Some labels may have a "Use-by date" rather than a "sell-by date" which means it should be cooked or frozen by that date to ensure maximum quality. If used after this date the flavor and texture of the product will begin to deteriorate. 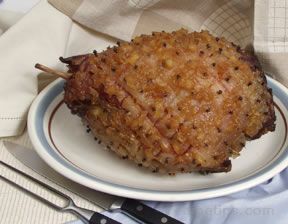 Ham may be fully cooked, partially cooked or uncooked. If it is fully cooked the label will indicate that it is "fully cooked" or "ready-to-eat". If it is not, it will clearly indicate to "cook before eating". Even though the precooked hams are ready to eat, their flavor is enriched from being baked to an internal temperature of 140°F. The nutritional value of the ham will also be shown on the label. The label will show calories, fat and cholesterol content, and it will list the nutrients contained. The label may also contain information such as cooking instructions and food safety and handling instructions. Looking at and feeling the cut of pork can give you information that the label will not provide. 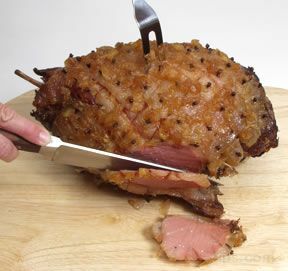 When shopping for a ham look to see if the piece is well-trimmed of fat around the edges and that it does not have a lot of fat running through it. Also look for the amount of marbling running through the lean part of the ham. You want to have a small to moderate amount of marbling running through to provide flavor and tenderness, but if it is excessive, it will cause the ham to be fatty. 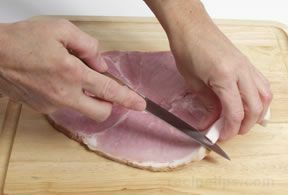 When selecting a whole ham this will be difficult because you will not be able to see any of the inside area of the cut. Pork today is raised much leaner that it was years ago so it is not as much of a problem to find lean cuts. 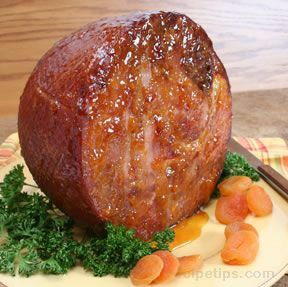 The ham you are selecting should be rosy in color and have a fine-grained texture. 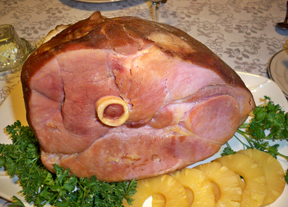 A ham with light or uneven coloring indicates that the ham may have been improperly cured. 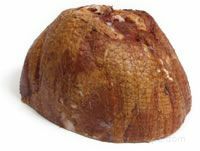 If the exposed surface of the ham has turned a faded green, it is an indication that it has been exposed to improper lighting or stored for an extended period of time at 40° F or higher. Be sure to select a ham with even rosy coloring. The meat should be firm to the touch. 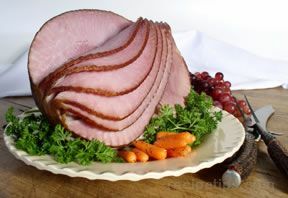 When selecting a ham half, portion, or slice, the surface of the cut may have an iridescent color. The iridescent color is a result of light hitting various exposed compounds of the meat after it is cut. The light causes a prismatic affect when it hits the exposed surface of the meat and gives it an iridescent appearance. The iridescent color is not a sign of deteriorating quality or any indication of a safety problem with the meat. 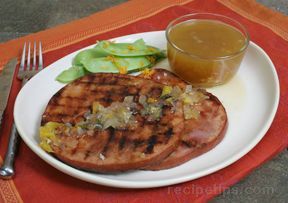 Avoid ham that has a grayish or green color to it. This coloring is caused by exposure to light and oxygen during the curing process. The exposure to light, oxygen and curing chemicals can cause a chemical breakdown and microbial spoilage. 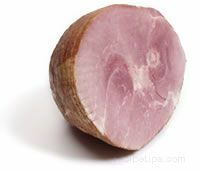 When purchasing a fresh ham, select a cut that is bright grayish-pink in color and has a firm texture. 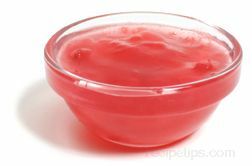 Avoid cuts that have a watery appearance, are pale pink in color and soft to the touch. 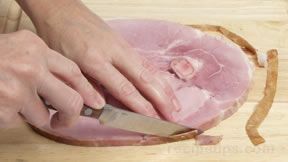 If the fresh ham is slightly greenish in color, it may be a sign of bacterial growth from being stored at 40° F or over for an extended period of time. It is sometimes difficult to know just how much ham to buy to have the proper amount for a particular recipe or to serve a specific number of people. 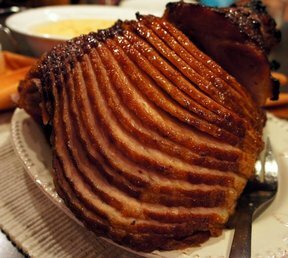 Some of the factors that will determine the quantity needed included whether the ham is bone-in or boneless, the number of people being served, and whether or not it will be served in controlled portions or if it will be served on a "help yourself" basis. 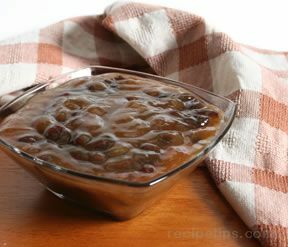 The following chart gives an approximate quantity per serving, which can be used in determining your needs, keeping the other factors that have been mentioned in mind. Also keep in mind the appetites of the people you will be serving. Serving several small children will certainly require less than if you are feeding several teens or young adults, and males will generally have larger appetites than females.